Sandra W. Lee and the cast of Bullet Catchers in rehearsal. 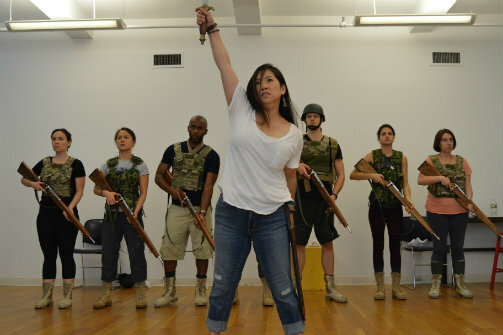 BOTTOM LINE: A new play raises the important topic of women in combat, infusing a real life issue with Greek mythology. The misconception that women are inferior to men both physically and in leadership qualities dominates many spheres of life, not least of all the military forces. Up until December 2015, women couldn’t officially apply for some positions in the U.S. Army, including the infantry. But even after the combat ban was lifted, women in uniform continue to fight criticism of the skeptics. Maggie Moore and Julia Sears, co-creators of Bullet Catchers (slang for infantry), joined forces with serving military members and veterans in extensively researching the issue of women in combat. The result of this two-year development is a play set in the not-so-distant future, following the first official mixed-gender infantry unit from recruitment to training to deployment. On top of daily life threats and the personal dramas unfolding at home, five women and two men experience constant pressure of being evaluated by their superiors. The military background of some cast members enriches the entire production with heartfelt, realistic nuances. Unfortunately we don’t get to know all seven members of the unit closely, and just enough information is provided to develop an emotional connection with some of them. I felt for Sergeant Kalli Kovas (Adrienne Brammer), a mother separated from her little daughter; and Lieutenant Colonel Maya De Los Santos (Jessica L. Vera), trying to appear tough in front of her subordinates by hiding the fact that she is married to a woman. But a lot of the relationships, inside and outside the base, are left as loose ends. Parallel to the infantry unit, we are introduced to Até, daughter of the god of War (Sandra W. Lee, doubling as Jordan, Maya’s wife). Até opens the play challenging her father by saying that war can have a woman’s face. To fulfill her mission she selects Maya as her “weapon.” Até appears throughout the play; invisible to mortals, she gestures with her hands, manipulating soldiers like a puppeteer. Bullet Catchers evidently strives for Greek-epic pathos here, but the result comes off as confusing. The reinvented goddess from Greek mythology seems to be from another play; Bullet Catchers is best when it is talking about real women in combat. With that said, Sandra W. Lee does make a few stunning appearances as Até. During the prologue, two massive shadows of Até dance on the walls of Judson Memorial Church as she swings her sword. In this, and many other instances, the dramatic lighting by Kelley Shih creates memorable visuals in a space with virtually non-existing set design. By itself, the empty hall of the late 19th-century church, with stained glass windows and arches supported by columns, is a dominating space. Bullet Catchers has a hard time making it home, partly because of the acoustics. It is really difficult to hear the actors if they are facing away from you, and with the audience seated on three sides this is unavoidable. But the acoustics pay off during the a cappella coda, sung by the entire cast. The play is sprinkled with dancing sequences, set to lyrical ballads, that emulate the everyday routine of the “bullet catchers.” These, and some other instances of inventive staging by director Julia Sears, are the most memorable moments of Bullet Catchers, but unfortunately the current production suffers from a lack of cohesiveness. Bullet Catchers is by Maggie Moore and Julia Sears. Directed by Julia Sears. Produced by Clutch Productions and Josiah Grimm. Sound Design is by Almeda Beynon. Lighting Design is by Kelley Shih. Featuring and co-written by Adrienne Brammer, Rebecca Hirota, Sandra W. Lee, Jay Myers, Victoria Nassif, Jessica L. Vera, Emma C. Walton, and Damion J. Williams.